Thursday July 14th 1898 I wrote some letters what spare time I had today, practiced some and got the meals. They finished the oats here and went down on Eds land in the afternoon. It was bed time when we got through supper. Friday July 15th 1898 I was all forenoon doing baking, churning, and getting the dinner. I practiced and sewed a little in the afternoon. I took a music lesson jist before supper. The boys worked late tonight, very warm. Saturday July 16th 1898 My work was not very hard today. I practiced and sewed a little. The boys quit work early on account of a break in the machine and we went to town after an early supper. I was over home awhile. The folks are still up at camp. Sunday July 17th 1898 It was a very warm day. We were about home all day. I read some in the afternoon. Levi went away in evening. 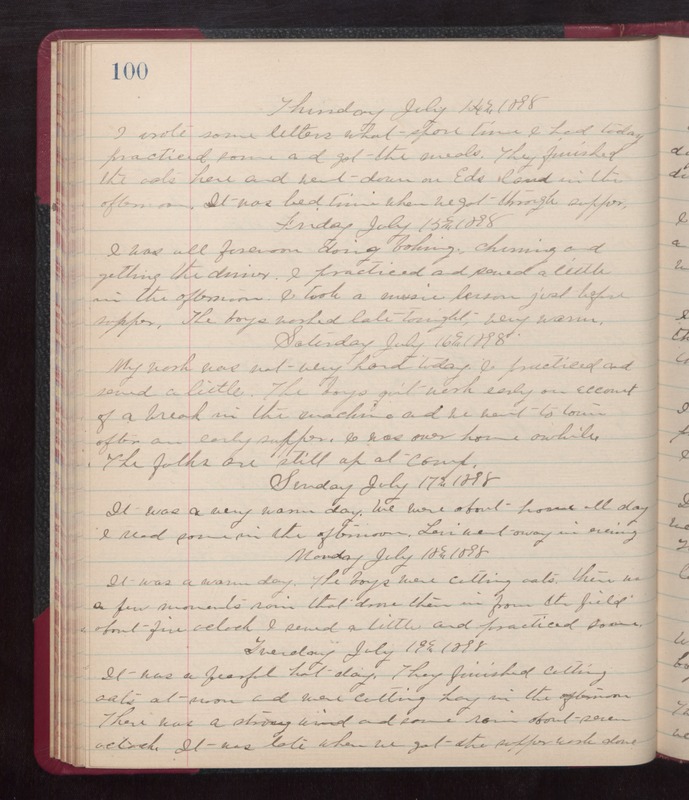 Monday July 18th 1898 It was a warm day. The boys were cutting oats, then in a few moments rain that drove them in from the field about five oclock. I sewed a little and practiced some. Tuesday July 19th 1898 It was a fearful hot day. They finished cutting oats at noon and were cutting hay in the afternoon. There was a strong wind and some rain about seven oclock. It was late when we got the supper done.